The theme of First Thessalonians is the coming of the Lord for His own and is pastoral rather than doctrinal. The Thessalonians were characterized by faith, love and hope which became known in all the regions round about. In Second Thessalonians Paul seeks to comfort and assure the saints who were troubled, through the deceitful work of Satan, by the false doctrine that the day of the Lord had already come. 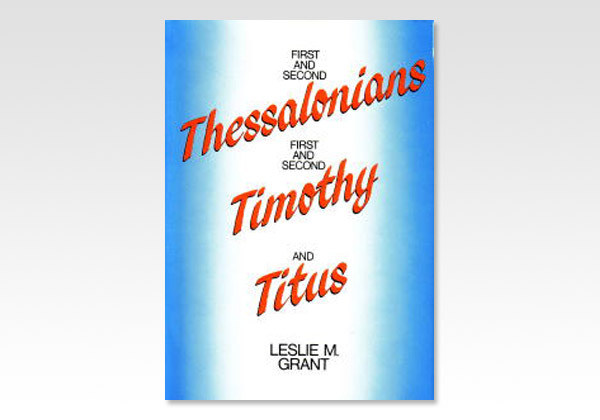 First and Second Timothy and Titus are very important epistles in that, unlike most of the other epistles, they are addressed to individuals. These are among Paul's last letters, written shortly before his death. In First Timothy Paul shows us the responsibility of the individual, as to his behavior, "in the house of God", the assembly. The Second epistle uses the term "a great house" rather than "the house of God", and plainly teaches personal responsibility when disorder, doctrinal and moral evil are introduced by men; so that separation from the evil becomes imperative if one is to maintain faith and a good conscience. The name Titus means "nurse". To properly nourish the souls of men we must allow the truth to first do its vital work in our souls. Thus Paul reminds Titus, and us, that truth rightly held, will produce personal godliness. The reader cannot help being edified by the author's easily understood presentation of the truth of the Word of God.